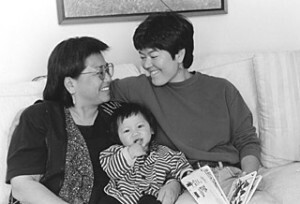 Intended for audiences of all ages, Love Makes a Family was a traveling exhibit designed to challenge stereotypes about lesbian, gay, bisexual, and transgender (LGBT) people. Through first-person accounts and positive images, this exhibit sought to challenge and change damaging myths and stereotypes about LGBT people and their families. The exhibit included photographs by Gigi Kaeser and interviews by Peggy Gillespie and was created by the Family Diversity Projects, a non-profit organization in Amherst, MA.